Concerning the Holy Ghost's Interpretation of J. Crew Catalogues by Elizabeth A.I. Powell, Leaky Boot Press, 192 pages. $17.99. In the mid-1990s, I made a collage out of J. Crew catalogs and hung it on my wall. The only explanation I can give for this behavior is my guilty fascination with what those catalogs were selling: a sunny, casual, vaguely retro vision of trust-fund living. Long before we had "Mad Men" to moon over, we had J. Crew — or, as fashion mecca Into the Gloss puts it, "90s J. Crew Catalogs Are a Normcore Dream." Elizabeth A.I. Powell gets that. Oh, boy, does she. 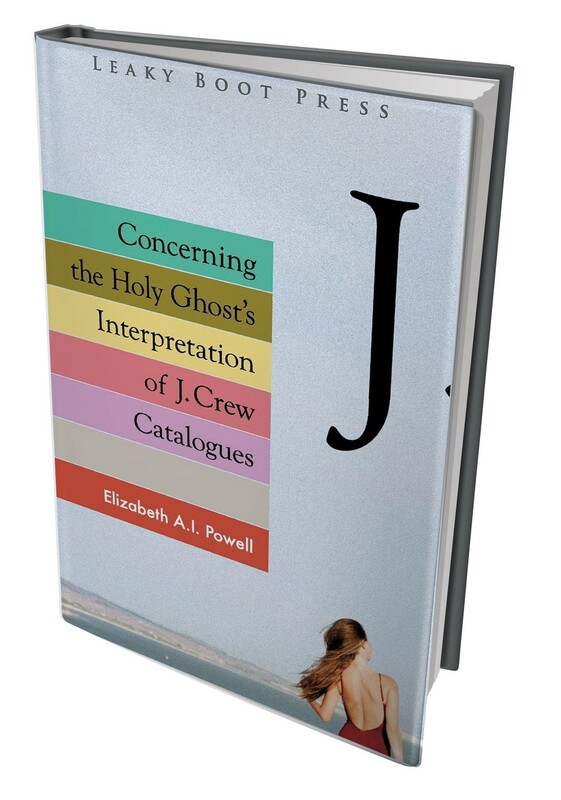 An associate professor at Northern Vermont University, editor of Green Mountains Review and author of two award-winning volumes of poetry, Powell has titled her first novel Concerning the Holy Ghost's Interpretation of J. Crew Catalogues. Whether it qualifies as a novel rather than a long prose poem is up for debate, as is whether J. Crew catalogs qualify as the modern, capitalist equivalents of holy writ. But Powell undeniably nails why those vintage photo spreads inspired such devotion. Her narrative concerns a series of fictional J. Crew photo shoots in 1998 and 1999. In a series of iconic locales — beach, cape house, campus — photographer Wolfgang Ackerbloom manipulates models Mindy, Helene and Tim in an effort to realize his vision of "sustaining in the present what no longer was, and making that the elixir for being in the unfathomable moment." Using his camera to evoke 1964 or 1957, Wolfgang is a "traffic director of nostalgia," a "choreographer of moments." Like art, his work is intimate, an effort to come to terms with his own memories. But every image also sells something. Powell reminds us so by periodically writing from the point of view of the catalog's ideal consumer: a middle-aged senator's wife named Kyra Snelling who buys the clothes in an effort to recapture pieces of her own past. The novel's action is almost entirely internal, floating dreamily from perspective to perspective. While Mindy reconsiders the affair she's having with Wolfgang, the mysterious Helene frets over a feeling that someone's dreaming about her. That dreamer turns out to be the catalog's copywriter, a failed novelist who, like Kyra, is obsessed with Helene as a modern version of a saintly icon. Finally, in cryptic fragments called "Intermezzos," Powell offers the promised perspective of the Holy Ghost: "I am the mystery of time producing nostalgia. I am the way dreams inform history." That heightened, poetic diction is typical of the novel's prose as a whole, and a little of it goes a long way. For every perfect phrasing ("that's what she saw in the J. Crew Catalogue, longing set out on the grand table of life"), there's another that feels clunky, overblown or willfully obscure ("Her look summed up the weight of the poetry that narrated a prayer book"). It's hard not to wish the book had been edited down to its lyrical essence — or, alternatively, that Powell had leaned more heavily into a novelistic mode. In some passages, she shows a distinct talent for the comedy of manners, as in her description of the copywriter: "he had a penchant, a true gift, for knowing what would be cool to the average American. He wore baseball caps before everyone wore them like a disease." More doses of that worldly wit would give Powell's novel a more varied texture. Instead of sustaining such satirical moments, though, she tends to dive back into the numinous, which is a difficult mood to sustain over nearly 200 pages of prose. Recurrent copyediting errors — repeated words, misplaced apostrophes — further complicate the read. For all of the book's stylistic infelicities, it's not soon forgotten. Powell is spot-on in using J. Crew to show how commerce, nostalgia and desire intertwine in the American imagination. Like Gatsby straining toward the green light that represents his idealized past, Kyra and the copywriter can't stop dreaming of Helene cavorting in a place that is always "a little way up the coast." And the only way to chase that dream is to buy what she's wearing. The veteran purveyor of pedal pushers and schoolboy blazers may not be so cool these days, but the J. Crew ethos lives on in "aspirational" Instagrams where influencers peddle the latest sweatshop goods. Powell reminds us: caveat emptor. Reading on Thursday, April 4, 7 p.m., at Phoenix Books Burlington. $3, includes coupon for $5 off the book. The original print version of this article was headlined "Quick Lit: Ghost in the Jeans"